We’ve started the spring season in style with a Holiday of the Month award from Dogs Today magazine! To celebrate, we’ve spoken to our recent guest Steve Phillips, who has been on many holidays to Blakeney with wife Sam, daughter Sally, and dog Alfie. Here Steve tells us why their fluffy family member can’t get enough of trips to the Norfolk coast. Steve, Sam and Sally love the relaxing atmosphere of Blakeney rather than busy seaside towns. When they first got Alfie 18 months ago, they couldn’t wait take her on wonderful coastal walks. “There are so many walks along dog-friendly beaches and coastal footpaths, so the holiday is a treat for Alfie as well as us. “She comes everywhere with us, we’ve never had to leave her in the cottage at any time. Even the local village pub is dog-friendly so we could enjoy a few meals out,” says Steve. “Now we have Alfie we always try and go on holiday with her. We wouldn’t leave her in kennels as she doesn’t really like other dogs unless she knows them. 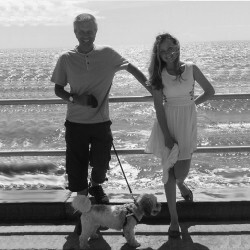 Pictured right: Steve, daughter Sally and little Alfie enjoying a day at the beach. After a long walk along the beach, Alfie loves nothing more than to curl up on her blanket and enjoy some much needed ZZZs. Steve and the family have stayed in 2 Garden Cottage and Snowdrop Cottage, both within close proximity of the beach. 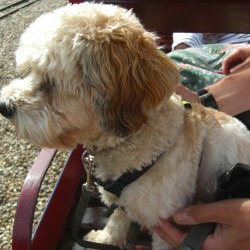 “We chose those cottages as we needed somewhere with secure outside space for Alfie. They both had lovely courtyards. 2 Garden Cottage had a nice conservatory too, so we could sit in there and leave the door open for Alfie to wander in and out. The interiors at both cottages were also perfect for Alfie to settle in. “The modern, homely feel meant we all felt comfortable, including Alfie. She would walk in and feel a bit baffled for a few minutes, but once her toys and blanket were on the floor she was at home. Steve prefers to keep Alfie downstairs when possible so she doesn’t steal any clothes or shoes when no one’s looking. Pictured left: ‘Seeing double’ Alfie (right) and Steve meeting Bonnie, the dog next door at 2 Garden Cottage. • Bed or blanket – she’ll sleep on anything that’s hers. • Cuddly toys – which she soon scatters across every room. • Tennis ball for the beach. 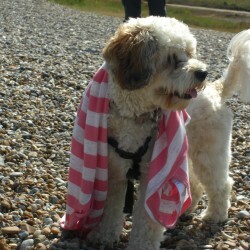 Steve offers advice to other dog owners considering a dog friendly holiday in Blakeney. “I’d say do it. Just take the essentials so your dog has some familiar surroundings, but other than that just enjoy it.